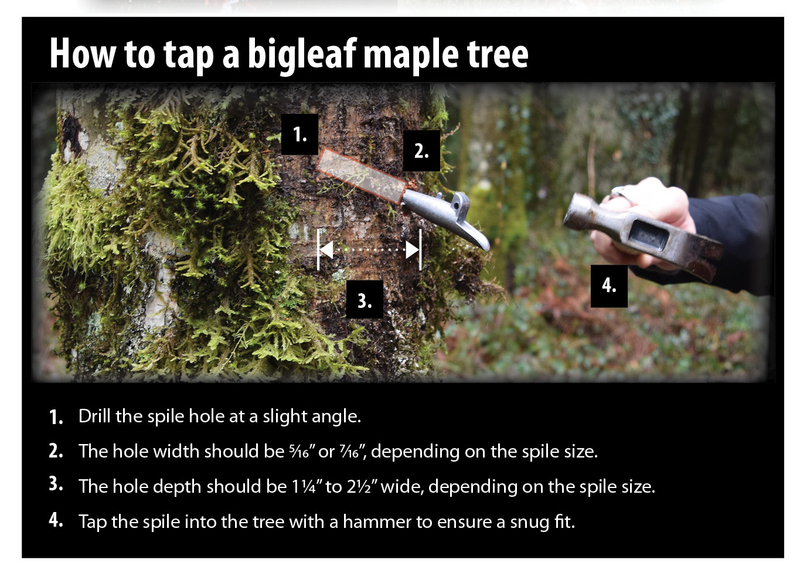 These photos show the steps involved in tapping a bigleaf maple tree. Maple syrup is one of the oldest forms of sweeteners, its use dating back hundreds of years. Maple syrup comes from maple tree sap, which is collected from living trees and boiled down to the thick, sweet syrup many of us like to pour over our pancakes. The sugar maple tree (Acer saccharum) is most commonly used in maple sugaring, but all maples produce sap that can be converted to maple syrup. Though not as high in sugar content as the sugar maple, the sap of bigleaf maple trees (Acer macrophyllum) grown in the Pacific Northwest produces excellent syrup. In addition to the delicious flavor, maple sap and syrup are high in minerals, such as potassium, calcium, magnesium, manganese, iron, and zinc, and can boost your energy without spiking your blood sugar level. Bigleaf maple trees tend to grow in coarse, gravelly, moist soils and among mixed groups of trees such as red alder, Douglas-fir, and western hemlock. The best bigleaf maple trees to tap are those with a wide-open crown and a trunk diameter between 4 and 18 inches. Young maples forming clusters of multiple shoots, or suckers, tend to work well due to their smooth bark and expansive root system. The bark of older bigleaf maple trees is grayish-brown and shallowly grooved, which makes tapping more difficult. In the Pacific Northwest, sap collection is done in the late fall and winter (after the leaves have dropped) through early spring prior to bud-break. The sap is made up of water, dissolved minerals, sugars, vitamins, and amino acids. It moves from the roots of the tree up the stem through the sapwood to provide water and nutrients to various parts of the tree. This happens when nighttime temperatures are at or near freezing. 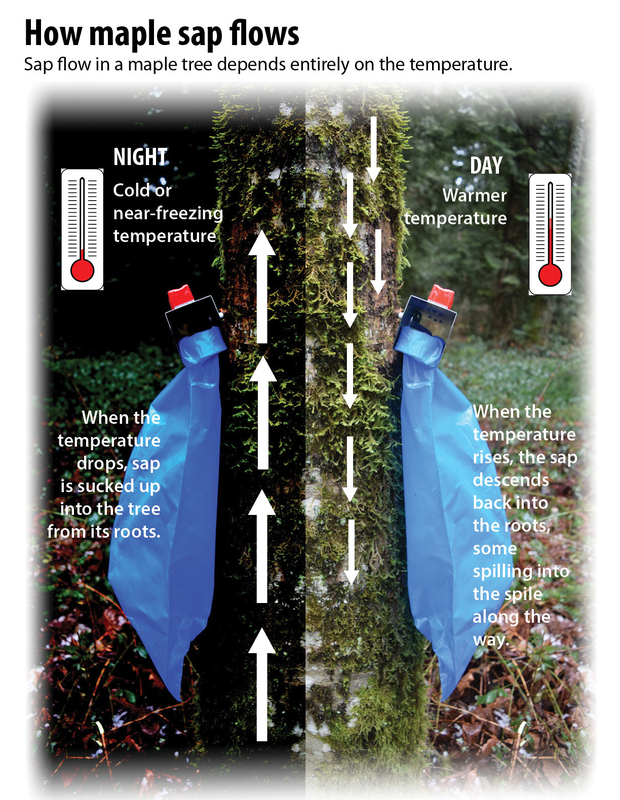 During the day when the temperature warms, sap flows back down the tree. The sap flow quantity and quality will depend on weather conditions, available moisture, and the soil type. Concentrations of micro- and macronutrients that are in the soil will have an effect on the color and taste of the maple syrup. Boil the excess water from the sap. A large quantity of steam is generated by boiling sap. So, it is best to do this process outside. Indoors, process small batches and ensure good ventilation. Continue to boil the sap until it takes on the consistency of syrup. Using a candy thermometer, check the temperature and finish the boil when the temperature reaches 7°F above the boiling point of water. The boiling point of water differs based on your elevation, so at sea level, the syrup is finished at 219°F. Pour syrup into a sterile jar and seal. Store in the refrigerator up to 2 months.